Posted on February 2, 2018 by admin wrote in News. 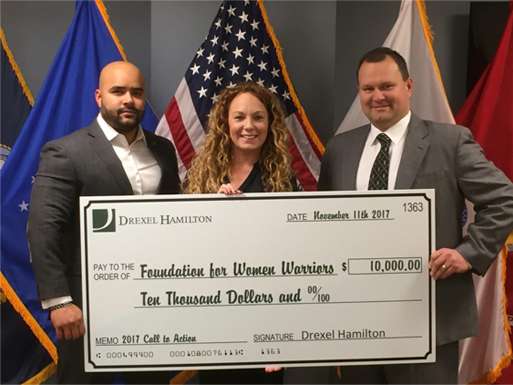 In honor of Drexel Hamilton’s third annual Call to Action Charity Day, it is our pleasure to present the the Foundation for Women Warriors with $10,000 to support their mission. Foundation for Women Warriors is a unique support organization created exclusively for the women veteran community of Southern California. We provide essential programs to empower the resiliency and professional development of Women Warriors. Every step is dedicated to supporting these outstanding women to navigate obstacles and realize their maximum potential after their service career. Warrior Connect: We connect veterans to affordable housing options, employment, professional development, transition assistance, advanced education and legal assistance. Warrior Assistance: We provide our women warriors with immediate grants to cover rent and emergency expenses such as medical bills, utility bills, and other necessities. Childcare Assistance: In collaboration with STAR Education, Foundation for Women Warriors is proud to present the newly launched Child Care Assistance program. To learn more about the Foundation for Women Warriors, visit: https://foundationforwomenwarriors.org/.